CIt’s easy to get carried away by the excitement about a new learning environment. Senior leaders love to talk cost efficiencies or new ways to improve results and rise through the rankings. Academic staff focus on new modes of teaching, and on ways to enhance their interactions with students. In the IT team, however, you need to keep both feet on the ground, taking a long, hard look at the challenges you’re going to face in implementation and support. While everyone else is focusing on the user interface, the features and the tools, there are the five questions you need to be asking. 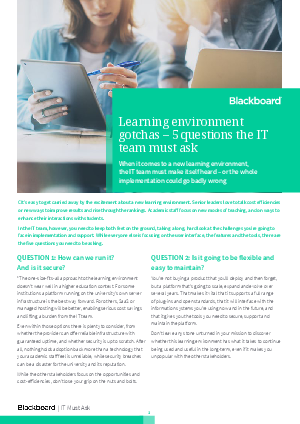 Download this paper now to find out the 5 questions the IT team must ask.